Loved the world over by collectors and watch brands alike, the Zenith El Primero has been keeping the world on time since 1969. 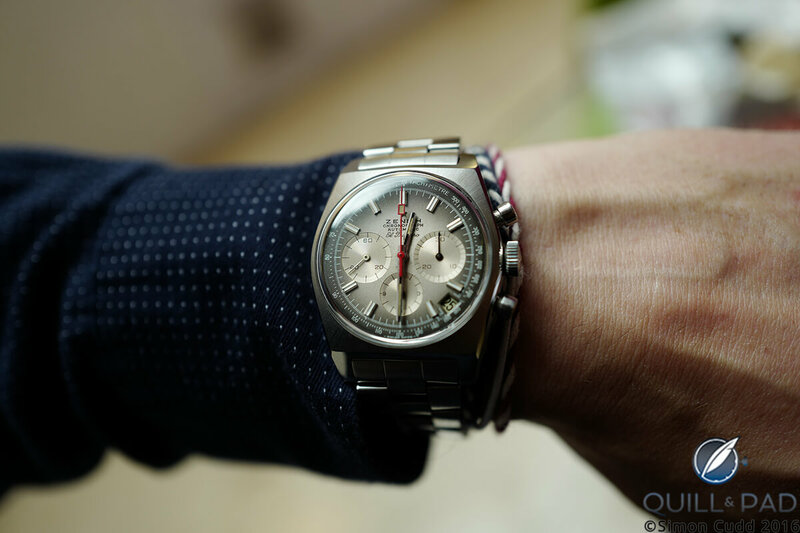 What makes the El Primero such an exceptional force still to this day? Let’s take a look and see. The El Primero was launched in 1969 as one of the movements in the “race” for the world’s first automatic chronograph. Whether Zenith, or Seiko, or the Caliber 11 by Büren/Hamilton/Breitling/Heuer was actually first or not is a debate for another day. The Zenith El Primero movement measured just 6.5 mm in height and just over 29 mm in diameter. But beating at a frequency of 36,000 vph/5 Hz, it boasted a power reserve of around 50 hours. This was remarkable feat for 1969, but being cutting edge, especially in such a troubled time for the Swiss watch industry, brought its own issues. During the 1970s, Zenith’s parent company decided to end manufacturing of mechanical movements due to the demand of quartz movements at the time (a sad state of affairs in my opinion), and the owners decreed the tools, parts, and blueprints should be thrown away. Thankfully, a watchmaker by the name of Charles Vermot had the foresight to look beyond the quartz crisis. Vermot went so far as to catalogue everything from tools to parts and then dismantled and hid the relevant machinery so all would not be lost. He is without doubt one of the unsung heroes of modern watchmaking. That machinery laid dormant for nearly a decade, as the El Primero did not see the inside of another watch case until the mid-1980s. While Zenith was the developer and manufacturer of the El Primero, it may well have been Rolex who made this movement famous. For the better part of a decade, from about 1988 to 2002, the Rolex Daytona was powered by a modified version of the El Primero. Rolex modified the El Primero by decreasing the frequency from 36,000 to 28,000 vph, adding a Breguet overcoil balance spring, removing the date complication, and making many other minor changes. The framework of the El Primero remained the same. Rolex choosing to use the movement was high praise for Zenith indeed. So what does the number 36,000 actually mean? See Measuring The Time Between The Seconds: The Truth Behind High-Frequency Movements for the long answer or read on for the short answer. Vph, (“vibrations per hour”), today often measured in Hertz (Hz), indicates how many times per hour the balance wheel rotates; two vibrations (semi-oscillations) equal one full oscillation. Picture a clock’s pendulum: as the pendulum swings one way it makes a vibration. When it swings back, it makes a full oscillation (two vibrations or semi-oscillations). Why would a watch manufacturer want to speed that up? The more often the balance oscillates, the less impact external forces will have on timekeeping. A watch that is knocked will have its balance disrupted for a short moment and then will need time to get back to normal running speed. The more oscillations the watch is able to make per second – or per hour – the faster the watch is able to recover and in turn get back to keeping accurate time faster. All else being equal, which they are not, higher frequency creates a more accurate movement. Having a watch oscillate so many times per hour also has its drawbacks. With componentry inside the movement running at such a high pace the lubricant can dry up more quickly, and the parts themselves can suffer more wear and tear. This was an unusual and difficult feat for the day as most watches then beat between 18,000 (2.5 Hz) and 21,600 vph (3 Hz). Rolex automatic calibers were set to beat at 19,800 vph well into the late 1970s and even early 1980s. The El Primero is a three-register column wheel chronograph displaying a 60-second chronograph register, a 30-minute counter, and a 12-hour counter. It has a date function, automatic winding, 31 jewels, and a power reserve of 50 hours. Like most column wheel chronographs of the day it uses a horizontal clutch to engage and disengage the chronograph timing functions. Its automatic winding was accomplished by means of a single reversing wheel and a ball-bearing oscillating weight. The El Primero features well-made components and intricate detail: the secret of the continuing beauty of this movement is that it looked modern for its time, yet it still fits in today and looks equally as contemporary. Apart from the accuracy and reliability of the movement, the El Primero is a chronograph of excess. Where one part would have done nicely, Zenith’s engineers used three. It is rife with small bridges and cover plates that are practically unnecessary, where integration would have been the logical modern choice. We need only to look at the small cover plates that hold the actual push pieces in place to start and stop the chronograph: on most watches of the day (and even to this day) they are integrated into the lever itself or housed under one of the bridges. But not the El Primero. That is just one small example. The most beautiful things in life are rarely the least complicated, and that is what makes the El Primero so great: it is a watch movement with style and grace. This is a movement that wants you to know it was the first and makes no apologies for that. The Rolex 4130 is a wonderfully accurate and reliable movement that will serve the consumer well and accurately tell time for years to come, but the El Primero is so much more: it has true heart and soul. The El Primero has changed little over the decades, which cannot be said for most movements from the early 1970s. If we think of brands like Rolex, Omega, Breitling, and others, we see that they have all left their vintage calibers in the sands of time. But Zenith has persevered in keeping the El Primero alive. And, boy, am I glad. For more information, please visit www.zenith-watches.com. Thanks for the article, and for including a photo of the 1969 model with the 1/100 minute scale. I am curious, who this scale was intended for mainly. Who was using the 1/100 minutes reading and for what purpouse? and how comes, that is faded out of use? I‘d really appreciate, if you could elaborate on this, especially since this aspect of the El Primero is mostly overlooked in pieces I could find so far.